Editor's note: This piece originally ran in December of 2013. 2013 has been the year of restaurant tipping drama in the Church. Or, so it seems in the news. In January, various news outlets reported that a pastor left no monetary tip to a waitress in an Applebees. Instead, she left this note as a tip: "I give God 10 percent. Why do you get 18 (percent)?" The waitress posted it online and subsequently got fired. Just last month, another story broke about a restaurant patron's discrimination as the reason behind stiffing a server. The gay server posted a photo of a receipt signed by some customers who also allegedly left this note: "I'm sorry, but I cannot tip because I do not agree with your lifestyle." The couple came forward and denied those allegations, producing a receipt and a credit card statement that indicates they did, in fact, leave a tip. But nevertheless, it becomes "bad press" for Christian restaurant patrons. Mostly recently, however, there has been a positive story getting national attention. The "Tips for Jesus" movement has countered some of the negativity. It is undetermined who is behind "Tips for Jesus," but this individual or group posts Instagram photos of receipts documenting exorbitant tips left for unsuspecting servers. The mission statement presented on the Instagram account: "Doing the Lord's work, one tip at a time." Unfortunately, however, stories like the first two are caricatures of a widespread reality: the Sunday lunch shift has become the most dreaded for most restaurant workers. Brian, a professed Christian, and a waiter who often serves the Sunday lunch crowd at a popular chain restaurant, sees a wide range of Christians' attitudes toward tipping. "I've personally heard the whole gamut of arguments for bad tipping. They range from 'not satisfied with service' to something similar to the patron from the Applebees scenario, to abundantly generous," he explained. This one goes without saying, but bad tipping becomes a barrier between the heart of a waitperson and the gospel. "When I think about the way some of my Christian brothers and sisters tip their servers in a restaurant, it makes me cringe," said Brian. "And it is doubly cringe-worthy to think about what those servers outside the church think of God when they see their patrons bow their heads to pray and then leave a sub-par tip." Note that he didn't say we would get spiritual "results" with someone if we treat them well. He was simply providing instruction on protecting the credibility of the Church through above-board actions. 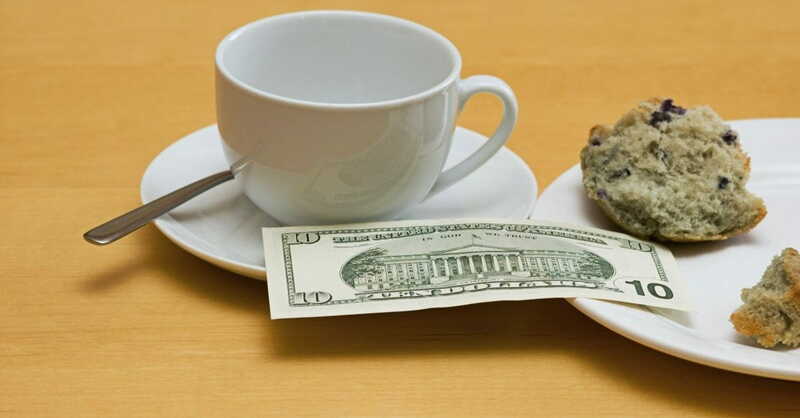 As restaurant diners, we should be above-board in the way we tip. It would be arrogant of us to think that someone could come into the Kingdom because of some wonderful tip we have left on the table. It is important to note that we cannot bribe someone into the Kingdom by giving them a good tip or any other type of compensation. Salvation is a work of the Spirit, and we, as humans, have the privilege of being fleshly agents in bringing others to truth. So, next time when tipping a server, think of it in terms of getting out of God's way, rather than "winning" someone with a good tip. While Timothy was writing to people in the church, he quoted Deuteronomy 25:4 and Luke 10:7, verses that are general instructions to God's people about properly compensating someone for a service. Why does it matter to God that we compensate well? As God's people, everything we do should be an attempt to imitate God's character and to display His glory. God is the ultimate Giver. So we, in turn, should not withhold a good thing--in this case, compensation--from those who serve us in restaurants. Think about this, beyond monetary compensation: what if God compensated us according to the way we serve Him? Even the most faithful and hard-working in the Church would fall terribly short. If God operated this way, we would be stripped of life's essentials. Just as our Father is a great Giver, we should practice generosity in our tipping. Very few things allow us to identify with the heart of God like giving. When we tip well--even when we don't feel it is deserved--we are pleasing to God. And that, in turn, brings us unspeakable joy.